6969 AK 221 10 Pfg. 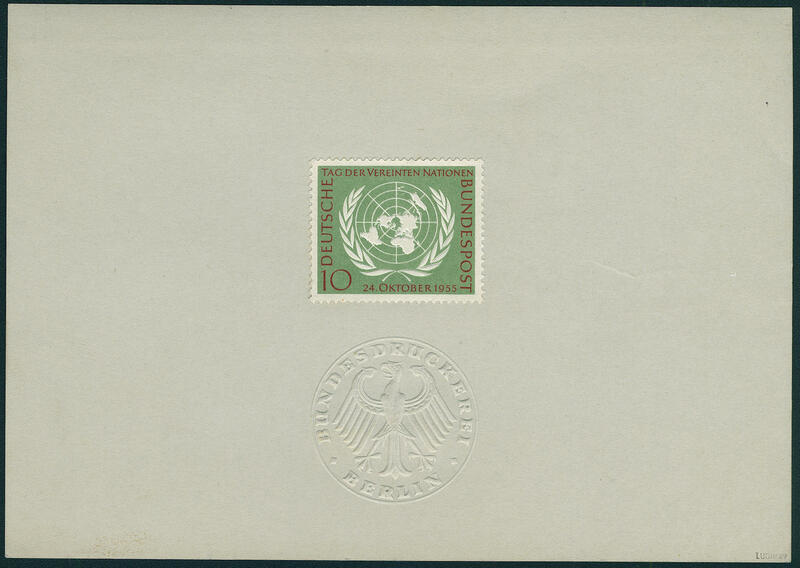 United Nations 1955, rare announcement carton with stamp seal the Federal Printing Office Berlin, without glassine protective sheet. There are only few examples from this known! 6970 AK 221Probe 10 Pfg. 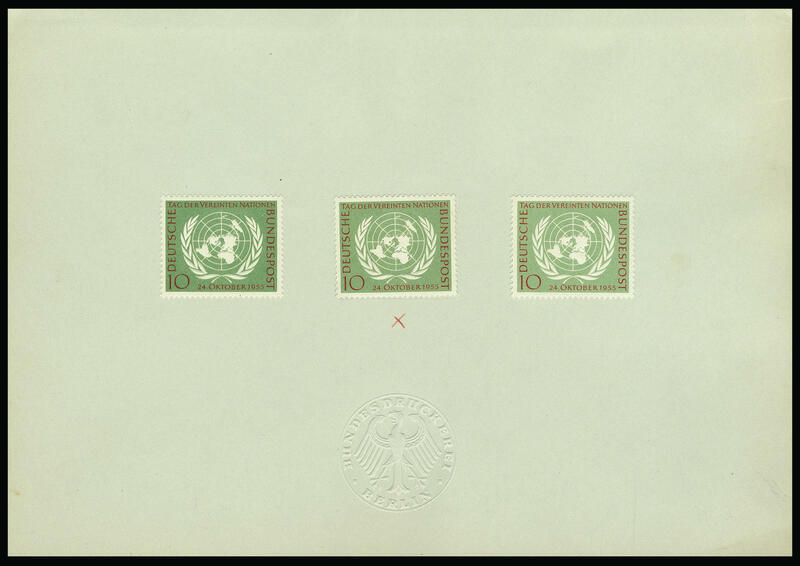 Uno 1955, three perforated trial proofs in mixed color shades on specimen cardboard with stamp seal \"Federal Printing Office BERLIN\". 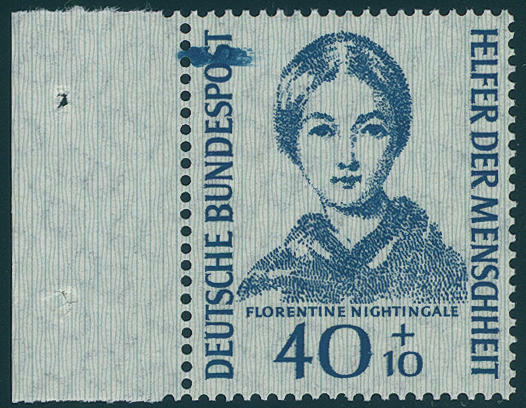 A significant Federal Republic rarity, like they also in the Michel special catalogue unlisted is! 6971 222F 7 Pfg. Welfare 1955 with variety \"background missing\", fresh colors and in perfect condition mint never hinged, without any signs. Rare! 6973 239PUo 10 Pfg. 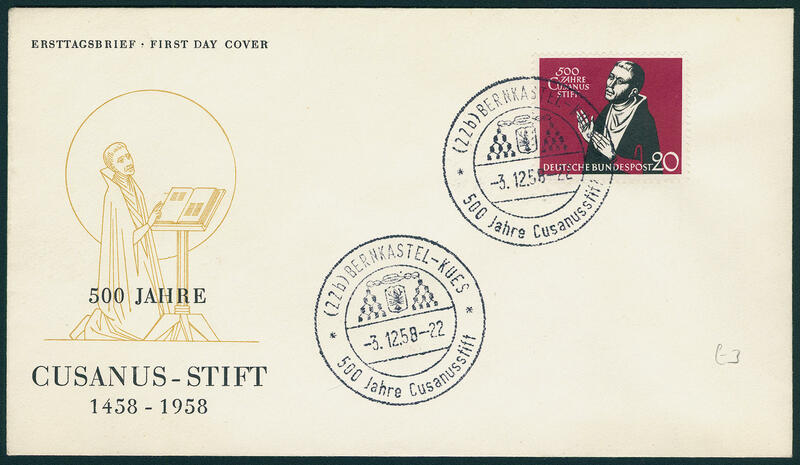 Catholic day Cologne 1956, proof in blue-green / dark brown red in lieu of olive green / dark brown red from upper margin, above unperforated, in perfect condition mint never hinged on watermarked paper. This piece comes possibly from the spoilage. In this kind extremely rare! 6974 239UoProbe 10 Pfg. 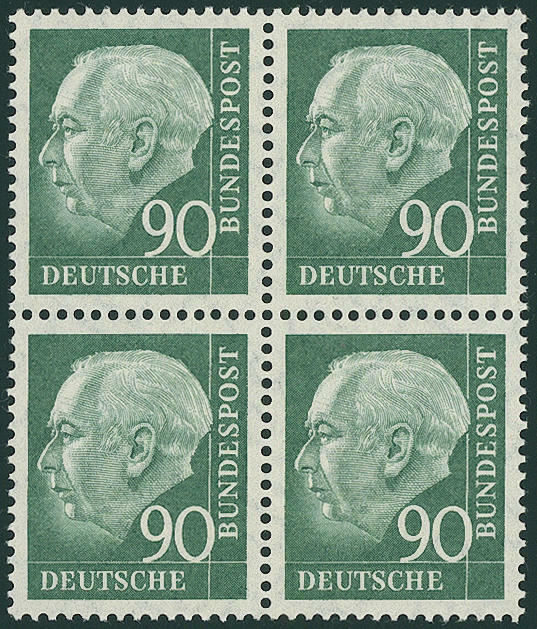 Catholic day 1956, proof spoilage printing in dark green / dark brown red in lieu of olive green / dark brown red, block of four from upper margin, above unperforated, unfolded, in perfect condition mint never hinged, without any signs. 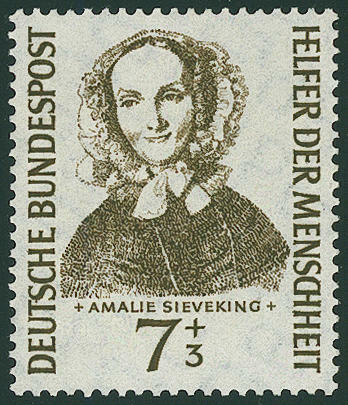 Extraordinarily rare, especially partially perforated are very few examples have become known! 6975 ⊙ 241Z 10 Pfg. 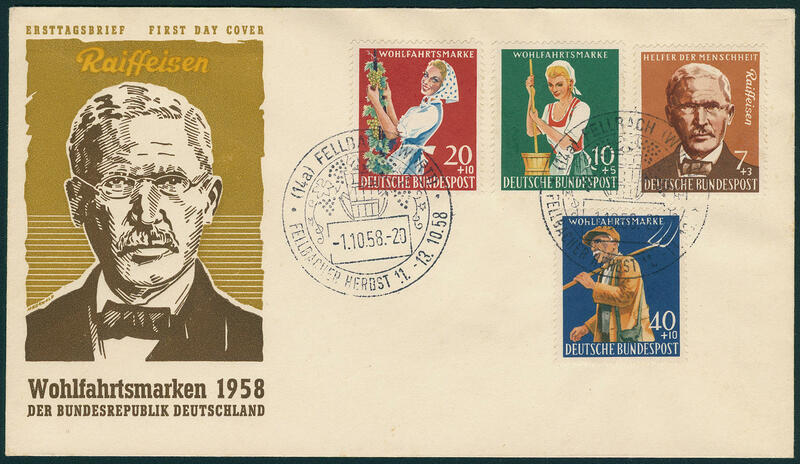 Europe 1956 with scarce inverse watermark, a few perforation a little shortened, neat cancelled \"HASSLOCH 19.9.56. \", photo expertize Schlegel BPP. Michel 4000,- €. 6976 255U 20 Pfg. 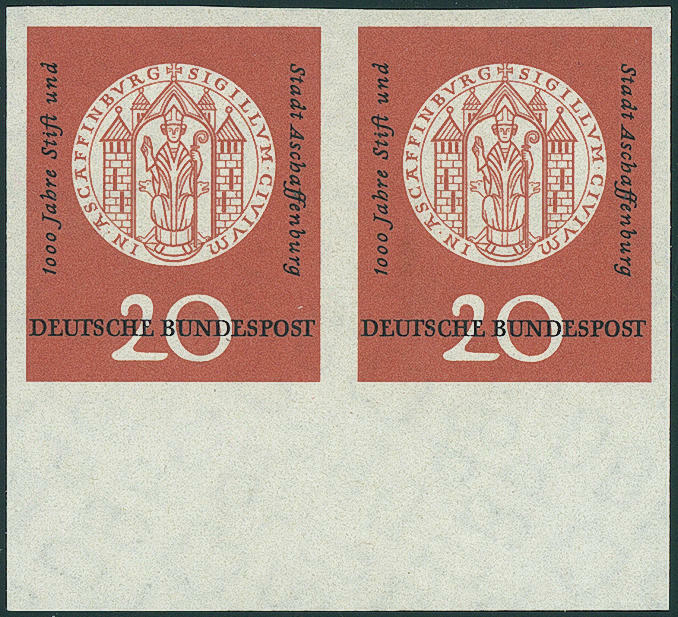 Aschaffenburg 1957, unperforated in the horizontal pair from lower margin, in perfect condition mint never hinged very decorative and scarce unit! Photo expertize Merkur Expert committee. 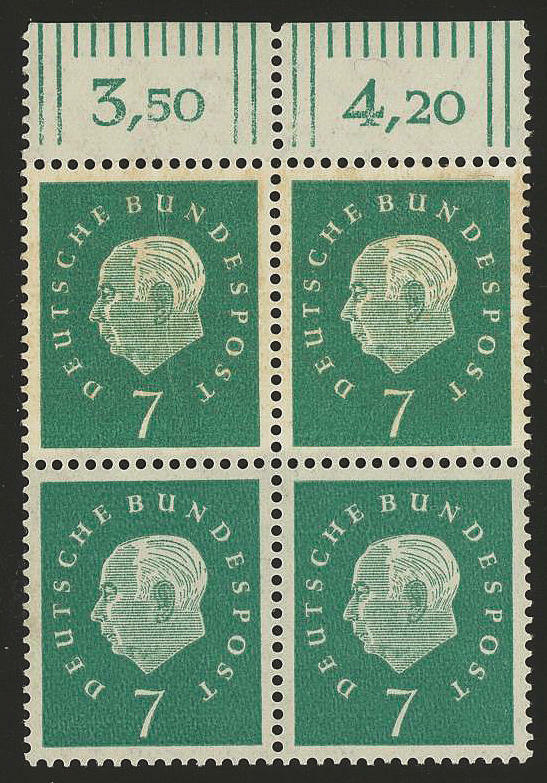 6977 259/65 Heuss II, block of four set, partly from left margin of sheet, unfolded, in perfect condition mint never hinged Michel 244,- €. 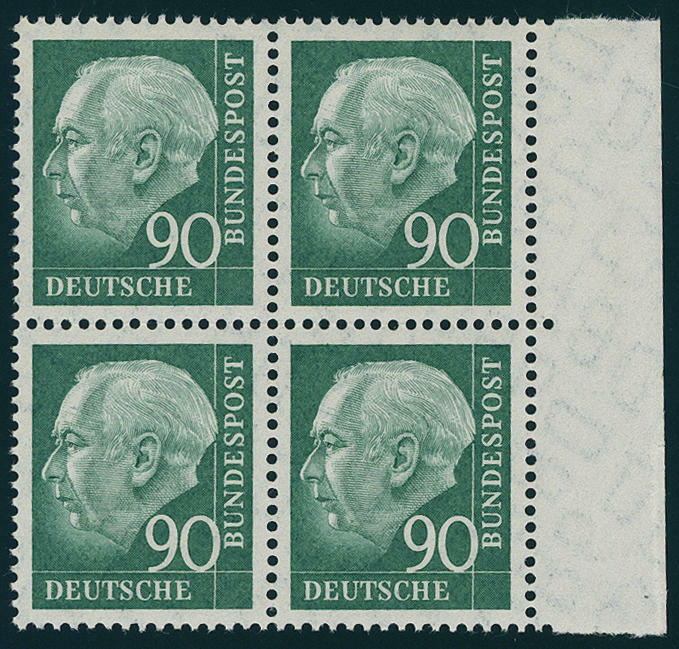 6978 259/65xv Heuss II, the complete set in blocks of four, uniform with ribbed gum, unfolded and in perfect condition mint never hinged without any signs. Michel 484,- €. 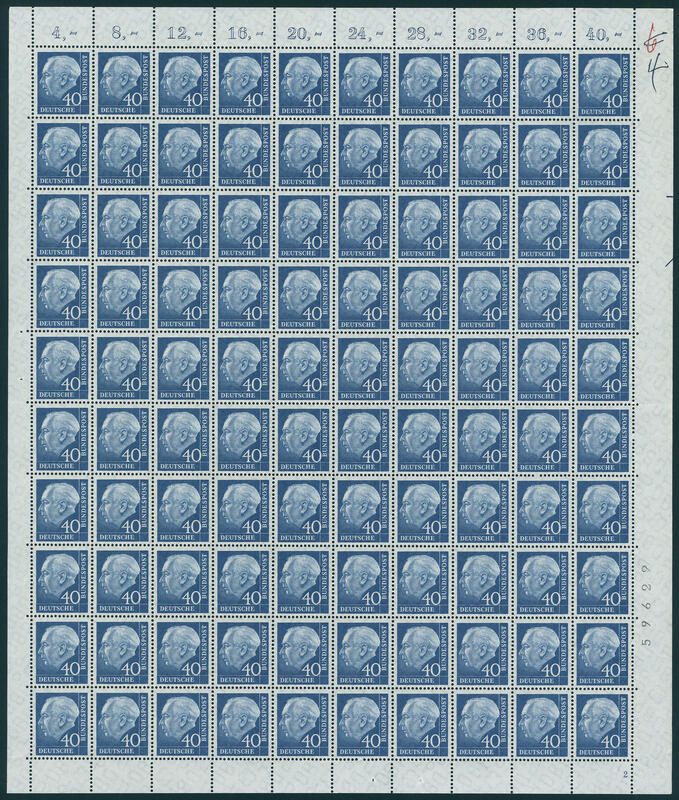 6979 259/65xw Heuss II, the complete set in blocks of four, partly from margin of sheet, uniform with smooth gum, unfolded and in perfect condition mint never hinged, without any signs. Michel 244,- €. 6980 ✉ 260 40 Pfg. 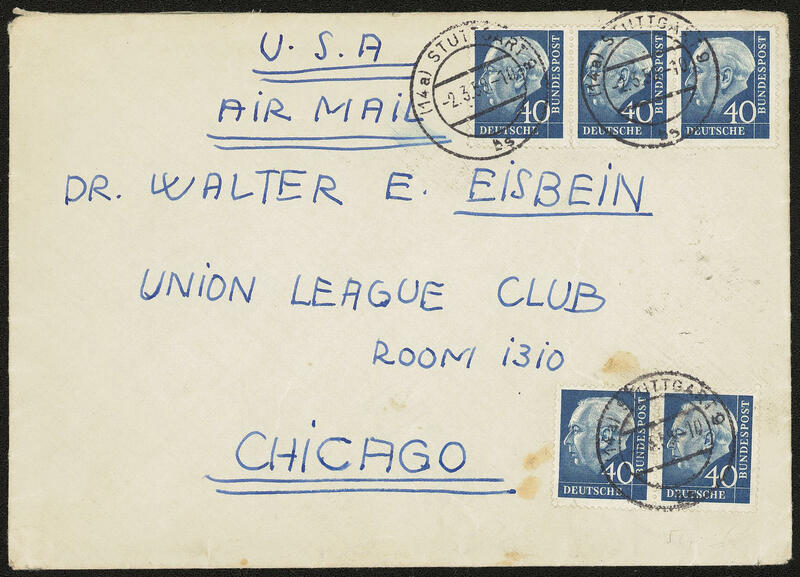 Heuss II, horizontal pair and horizontal strip of three as scarce mass multiple franking, a value corner crease and cover minimal blotched, on correctly franked, utterly commercially used cover from \"STUTTGART 2.3.59\" to Chicago / USA. 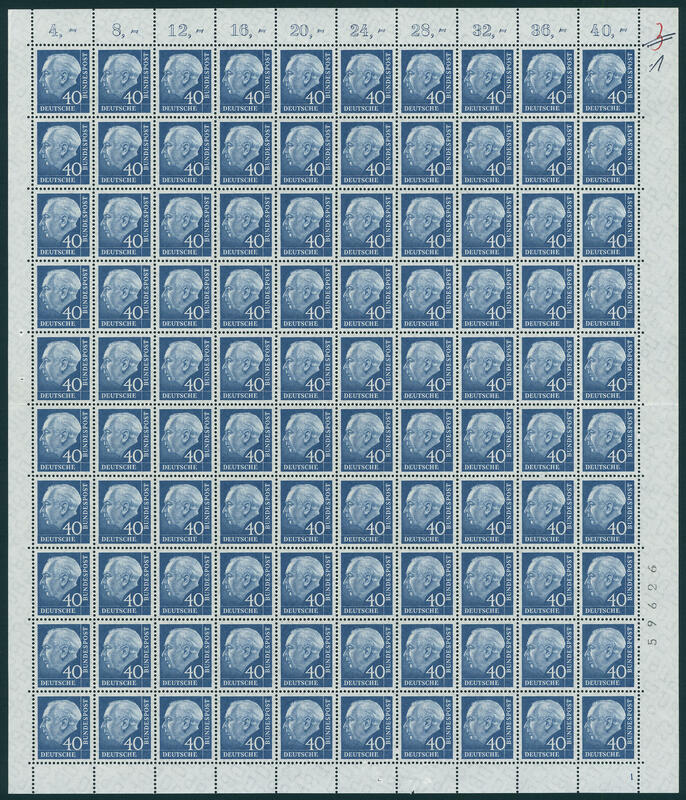 An extraordinary franking rarity! Michel 700,- €. 6981 260xv 40 Pfg. 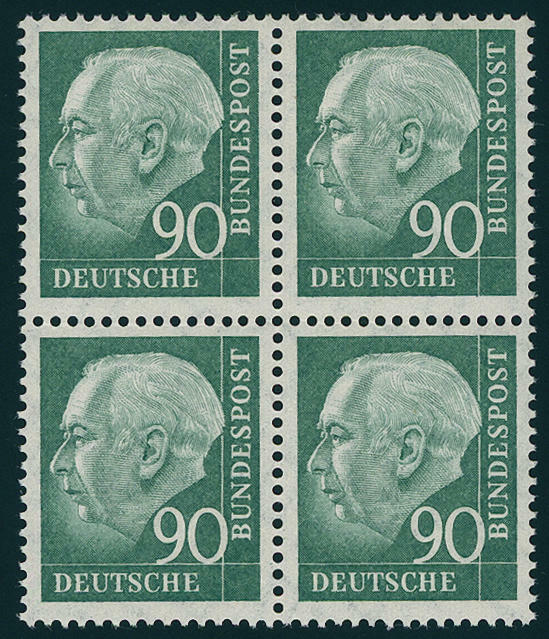 Heuss 1956, ribbed gum, complete original sheet to 100 values, perforation once horizontal prefolded, with printing number 1, in perfect condition mint never hinged Michel 800,- €. 6982 260xv 40 Pfg. 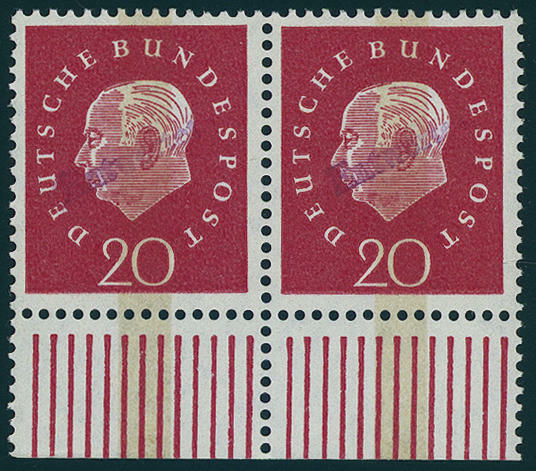 Heuss 1956, ribbed gum, complete original sheet to 100 values, once horizontal in the perforation prefolded, printing number 2, in perfect condition mint never hinged Michel 800,- €. 6983 ✉ 262 40 Pfg. 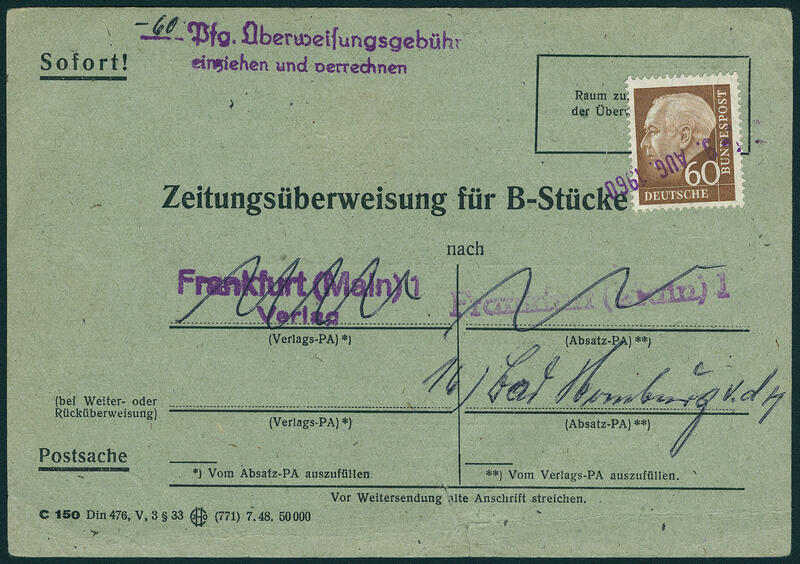 Heuss II, in perfect condition as correctly franked single franking on rare newspaper transfer for B-pieces, at the bottom tear, with violet dated postmark \"9. 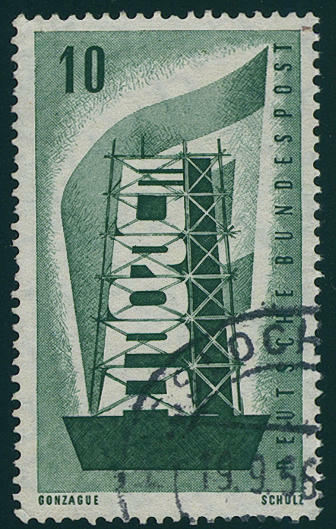 August 1960\". Scarce utilization! 6984 ⊙ 264xw 80 Pfg. 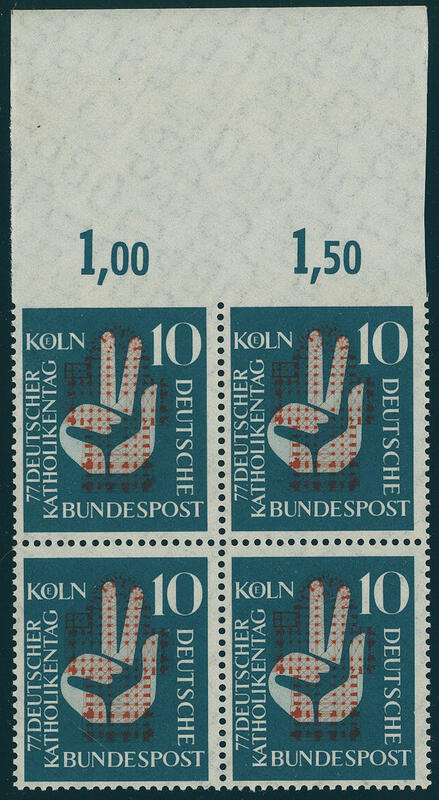 Heuss II, smooth gum, vertical block of eight, neat cancelled \"BURGSINN 28.7.60. \", scarce unit, photo expertize \"the quality is perfect\" Hans-Dieter Schlegel BPP. Michel 520,- €. 6985 FDC 281/301ex Year 1958 except for Michel no. 285 and 294 complete on 14 faultless illustrated First Day Cover. Michel 225,- €. 6986 302Pa 7 Pfg. Heuss medallion 1959, block of four from upper margin with spectacular variety \"both upper values on glued paper web\", unfolded, in perfect condition mint never hinged, without any signs. A large varieties rarity, the already single due to missing offers in the Michel special catalogue only noted without price is. In this kind as block of four a spectacular Federal Republic rarity and probable unique! Photo expertize \"the quality is perfect\" Hans-Dieter Schlegel BPP. 6989 304Pa 20 Pfg. Heuss medallion, vertical pair with sensational variety \"glued paper web\", in perfect condition mint never hinged a significant varieties rarity and possibly unique. By Michel catalogue unlisted! Photo expertize \"the condition is perfect\" Hans-Dieter Schlegel BPP.